sbca = findStructuralBC(structuralmodel.BoundaryConditions,RegionType,RegionID) returns the structural boundary conditions and boundary loads assigned to the region specified by RegionType and RegionID. The function returns structural boundary conditions assigned by structuralBC and boundary loads assigned by structuralBoundaryLoad. Find the structural boundary conditions for the faces of a 3-D geometry. Create a structural model and include a block geometry. Include the block geometry in the model and plot the geometry. Specify the surface traction on face 1 of the block. Specify the pressure on face 3 of the block. Apply free constraint on faces 5 and 6 of the block. Check the boundary condition specification for faces 1 and 3. 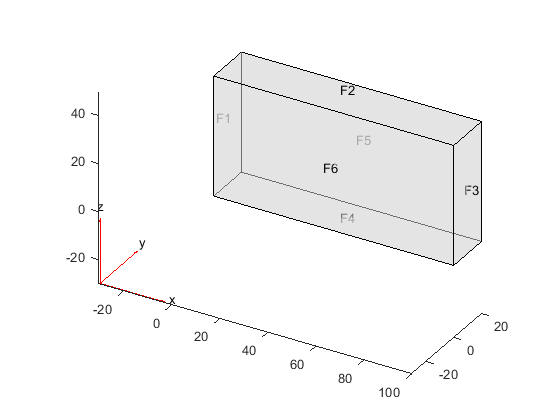 Check the boundary condition specification for faces 5 and 6. Structural boundary conditions of the model, specified as the BoundaryConditions property of a StructuralModel object. Geometric region type, specified as 'Edge' for a 2-D model or 'Face' for a 3-D model. Structural boundary conditions and boundary loads assignment, returned as a StructuralBC object. For details, see StructuralBC Properties.